Price: £1.49 (incl VAT) Sorry, this item is currently unavailable. Click here to receive notification when this product comes back into stock. Lypsyl Watermelon Burst is a lip cream containing aloe and vitamin E with SPF 15. 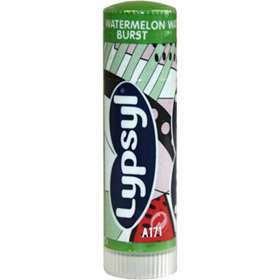 Lypsyl Watermelon Burst protects, soothes and moisturises lips. Paraffin, Glyceryl Stearate, Paraffinum Liquidum, Octocrylene, Polysorbate 65, Triacontanyl PVP, Aqua, Aroma, Butyl Methyoxydibenzoylmethane, Ethylhexyl Methoxycinnamate, Zinc Oxide, Aloe Barbadensis Leaf Juice, Citric Acid, Methylparaben, Propylparaben, Sodium Saccharin, Tocopheryl Acetate. Product code: LYP67J Price: £1.49 (incl VAT) Sorry, this item is currently unavailable. Click here to receive notification when this product comes back into stock.